Consider for a moment that life is not a random event or an accident of circumstance and that the essence of who we are continues, even beyond death. In Seeking Soul Mates, Spirit Guides, and Past Lives, we can discover new meaning to our lives and garner valuable insights into our experiences! With an artful blend of scientific research and heartrending narratives, this book demonstrates how we can recognize and embrace the spiritual relationships that determine our life’s path. Taking us on a journey, illustrated by his professional and personal experiences, Mr. Scheinberg offers us a fresh and intimate glimpse of the fascinating unseen world of eternal love and the enduring soul. And in so doing, he encourages and inspires us to embark on a soul searching expedition of our own. 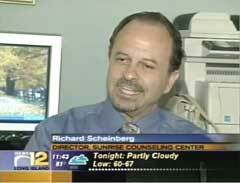 Richard Scheinberg discusses a subject from his new book, Seeking Soul Mates, Spirit Guides, and Past Lives, on News12. "Award-Winning Finalist in the New Age: Non-Fiction category of the National Best Books 2009 Awards, sponsored by USA Book News" "Award-Winning Finalist in the Spirituality: Inspirational category of the National Best Books 2009 Awards, sponsored by USA Book News"
"A must read for anyone remotely spiritual, who has ever pondered the question of ‘What happens to us when we die?’ He is a true master in his field…"
"Remarkable stories of how we can all seek and find our eternally loving, spiritual connections." "I found his calming voice guiding me on a new journey of exploration and discovery. I am moved with spiritual reassurances of hope, rationale and inner peace." "I am captivated by Richard’s seductive writing style that makes this book so easy to read." –Bill Solz - LCSW, CASAC, EMDR cert. "Richard’s offering of this work is both an educational and spiritual gift to those with any level of interest in the ultimate meaning of life. The content will satisfy many personal yearnings and enhance one’s energy in seeking life’s direction while also improving personal relationships. I recommend this concise book to lay people and professionals alike.."
"An honest, personal and intimate look into discovering your many selves and connection with others." What if someone told you that the most difficult period in your life may be a blessing in disguise? As a psychotherapist with 28 years of experience, Richard C. Scheinberg has candidly and succinctly summarized the spiritual and deeply personal transformation of ten people attempting to overcome the worst challenges of their lives. In this inspirational book, Mr. Scheinberg also reveals how he survived the most difficult periods in his own life. Furthermore, he conveys his personal conviction that our common strengths emanate from a source more powerful than any challenges that may come our way.